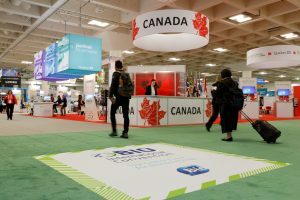 The BIO 2019 International Convention is the world’s largest gathering of the biotechnology industry and is expected to draw over 16,000 attendees from more than 67 countries to discuss the business of biotech, June 3 – 6, 2019 at the Pennsylvania Convention Centre. The key benefits of attending the 2019 BIO International Convention include, access to global biotech and pharma leaders via BIO One-on-One Partnering, exposure to industry thought-leaders with over 500 education sessions at your fingertips, and unparalleled networking opportunities. Contact BioNB to learn more about the Atlantic Canada mission to BIO 2019. Conference highlights include: oceans industry showcase; international delegations; conference and workshop programme; networking opportunities; on site B2B meetings; and the annual Oceans Gala Dinner all under one roof at the Halifax Convention Centre. More details to come. Visit the 2018 conference website here. A unique forum for business executives, government officials, academic researchers and end users to share the latest advances in industrial chemicals and products, food ingredients, advanced biofuels and biorefinery platforms, synthetic biology, agricultural technologies, crop production and more. We would be happy to hear from you. If you'd like to be kept up to date on news from our organization, you can enroll for the BioFlash Newsletter and have it delivered straight to your inbox. Just fill out the form below. By clicking Sign Me Up, you agree to receiving messages from BioNB. You can withdraw your consent at any time.